INFO: Adventure started with the long journey which lasted more than five hours. It was the destination from Sweden to the Hurgada in Egypt. After that we had five more hours by bus through the desert. We arrived in the Luxor our final destination in the late afternoon just after the sunset and checked in on our hotel or the boat. We stayed at the boat with name of La Boheme. La Boheme boat has been inaugurated in 2008. 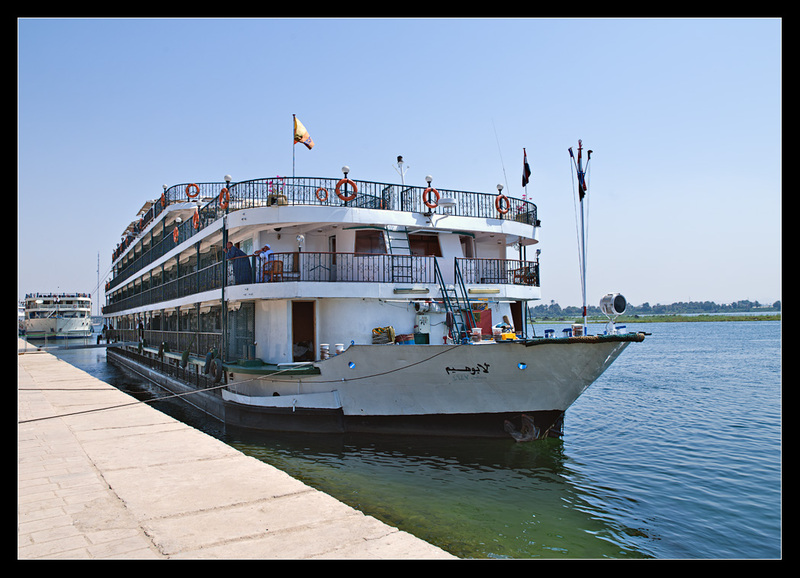 This exquisite vessel is built according to the standard of the new 5-star deluxe generation of the Nile boats. Inside the boat was exactly as described in brochure and I was really pleased. STORY: Early in the morning we started our first day in the Luxor by visiting the Valley of the Kings. The valley where used for a period of nearly 500 years from the 16th to 11th century BC as a tombs constructed for the Pharaohs and powerful nobles of the New Kingdom (the Eighteenth to the Twentieth Dynasties of Ancient Egypt). The valley stands on the west bank of the Nile, opposite Thebes (modern Luxor), within the heart of the Theban Necropolis. The wadi consists of two valleys, East Valley (where the majority of the royal tombs are situated) and West Valley. Photography wasn’t allowed and we left our cameras at the bus. I was been there 3 times before and will upload some pictures later in my photo gallery. Our next stop was at the Hatshepsut temple. She was well known as the first female pharaoh. 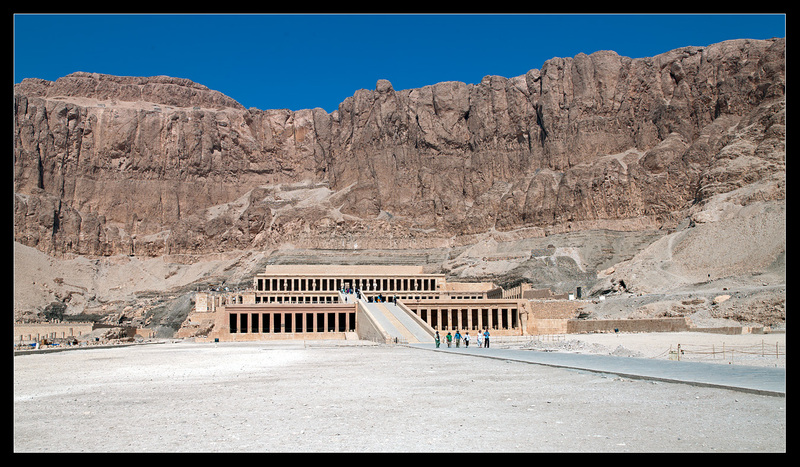 This temple was located beneath the cliffs at Deir el Bahari on the west bank of the Nile and near the previews visited Valley of the Kings. This was my first visit to this temple considering that I have been in Luxor many times before. It was already plenty with tourist present at the site making my photographing more difficult. Taking the shot of the whole temple without people was almost impossible. Nowadays we have the Photoshop which can fix all this problem but it still takes some time to do the work. I started taking the photos with my Hasselblad but I didn’t cheek for the battery. I forgot my second battery at the bus… somehow. Luckily I had with me my Canon 5D Mark II with 16-35 F/2.8 Mark II which did good work anyway. I was really hot and after 45 minutes we decided to leave the place and continue to the next place. The alabaster factory and the shop was the next stop. This is the part of the tourist attraction showing the way how to hand made the alabaster vases and other products. Even for tourists to spent some money and help local economy. The shop had anything you wanted created in all kind of the stones and other material inspired from the ancient times. 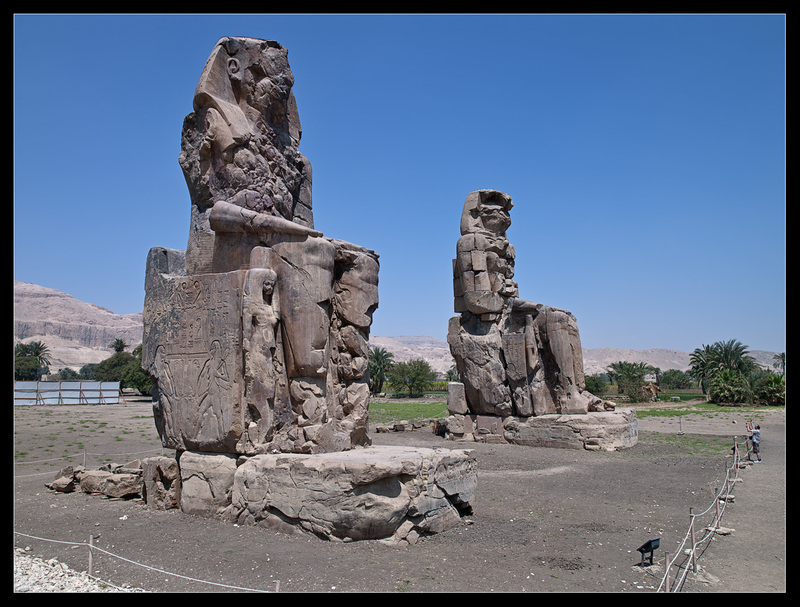 The last place to visit was the Colossi of Memnon or two massive stone statues depicting the Pharaoh Amenhotep III. Both statues are quite damaged, with the features above the waist virtually unrecognizable. The western (or southern) statue is a single piece of stone, but the eastern (or northern) figure has a large extensive crack in the lower half and above the waist consists of 5 tiers of stone. These upper levels consist of a different type of sandstone, and are the result of a later (Roman Empire) reconstruction attempt. It is believed that originally the two statues were identical to each other, although inscriptions and minor art may have varied. I have been there many times before but this time we where the only visitors. I made many good shots with my Hasselblad without single people in the front of the statues and was really happy about that. Next and the last visit in the Luxor before we stared our cruise was located at the other side of the Nile and it was the temple of the Karnak. 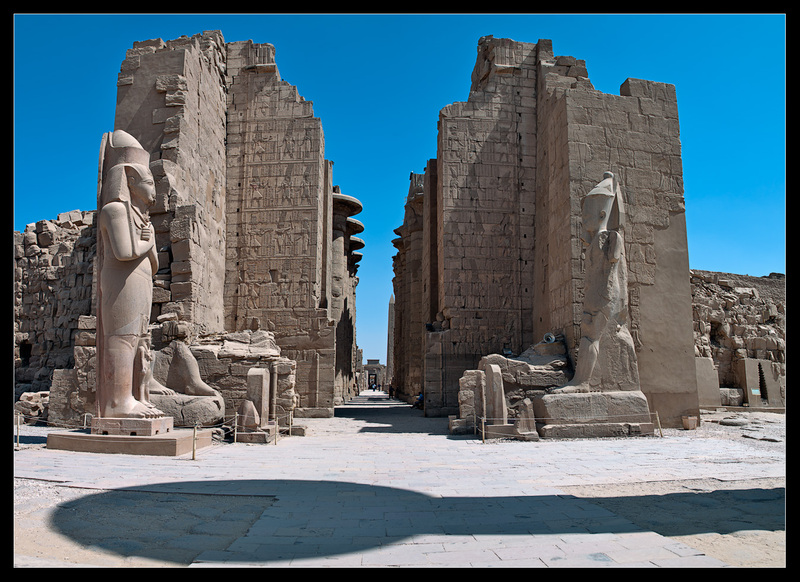 The Karnak Temple Complex comprises a vast mix of decayed temples, chapels, pylons, and other buildings. The complex is a vast open-air museum and the largest ancient religious site in the world. It is one of the mostly visited historical place in Egypt after the Giza Necropolis in the Cairo area. I have been in this temple complex many times before and it was always crowded with the tourists. Right now after Egypt’s revolution number of the tourist was less that usually and was good for my photography. I used my Hasselblad with the 35 mm and my 5D Mark II with 16-35 as well. The rest of the afternoon we spent at the boat floating in the south direction to our next stop. I took many pictures from the upper deck during this day. Day 2 We started early in the morning by visiting the Horus temple located in the city of Edfu. Transportation from the harbor to the temple was organized by the horse chariot. The temple was located in the middle of the city and the trip was short but interesting. Whole town was built on he same location as the old one and as the guide pointed probably on the original ground foundation. This is the same story all over the Egypt. 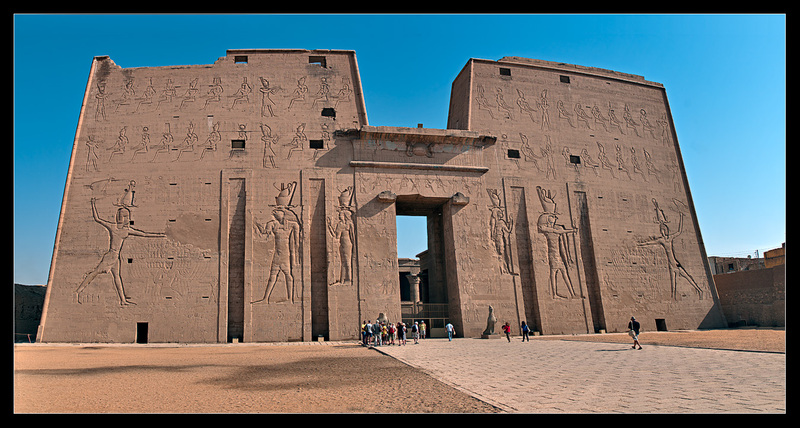 Temple of Edfu is one of the best preserved temples in Egypt. 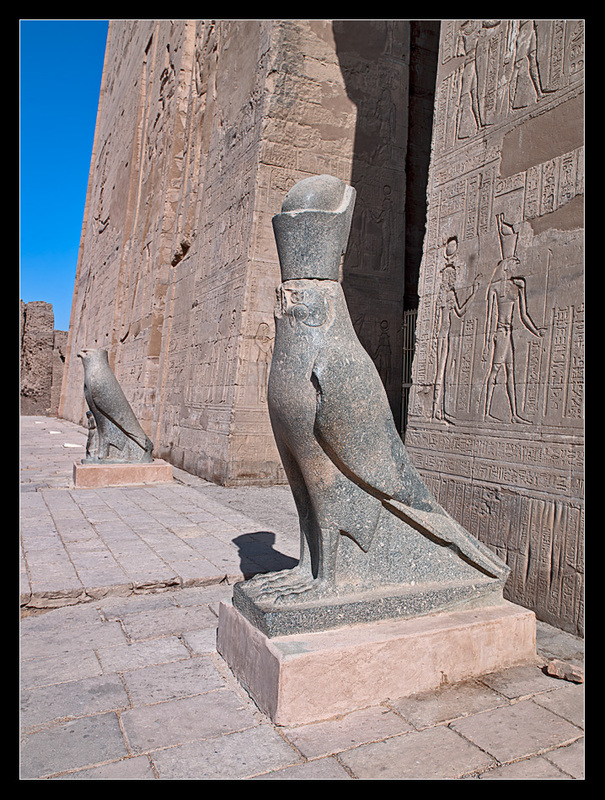 The temple was dedicated to the falcon god Horus-Apollo and was built in the Ptolemaic period between 237 and 57 BC. The inscriptions on its walls provide important information on language, myth and religion during the Greco-Roman period in ancient Egypt. It was plenty with salesman in the front of the entrance trying (aggressively) to sale their products. They don’t accept no please or not interesting and continuously follow after you. This is everywhere in the Egypt not just in the Edfu and is the part of the adventure. I used my Hasselblad with 35mm and Leica D-Lux 5 to document this ancient site. We get same kind of the transportation on the way back through the towns main street. When all passenger was back on the boat than we continued to float to the new destination. During this afternoon I was on the upper deck taking the pictures of the landscape and people on the river Nile. We arrived late in the afternoon at the Kom Ombo temple area. The temple was located five minutes from the docking station and we just took the shot walk to get there. It was the beautiful light with the afternoon sun crating ideal atmosphere for photography. We arrived almost first at the temple area and I took few good shots outside the temple with just a few people inside the temple. 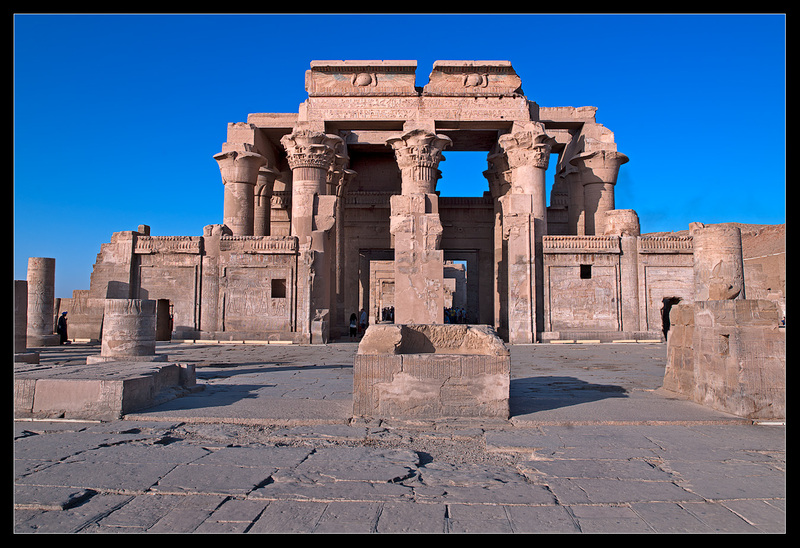 The Temple of Kom Ombo is an unusual double temple built during the Ptolemaic dynasty in Egypt. It was dedicated for tow gods, crocodile god Sobek and falcon god Horus. Soon after the guided presentation we get an hour to explore temple and wait for the sunset. On the way back as already mentioned before you need to past through the salesman barrier. If you want to win this battle (if you are not interesting to buy anything) simply ignore them and avoid the eye contact. Same evening we continued to cruse south on the way to the Aswan. We arrived late in the evening and anchored at the same place for the three nights. We started early in the morning around seven o’clock. We always get wake up calls from the reception approximately one hour before excursions. This was enough with time to wake up and even for the breakfast. 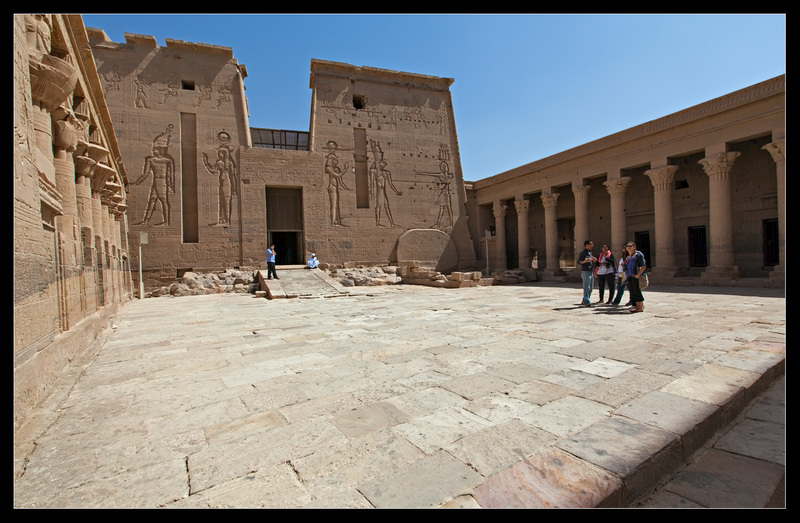 This morning was planed for visiting the Philae Temple of Isis, on Agilkia Island in Lake Nasser and the Aswan dam. Mini bus was waiting outside ready to take us to the first destination. We draw through the city and get possibility to see some people on the street on their way to the work. Aswan dam was constructed to control overflow of the river Nile and for production of the electricity. The dam was constructed between 1960 and 1970, and has had a significant impact on the economy and culture of Egypt. We had 30 min to take some pictures and read some information about construction and usage. I took shots from both sides of the dam and even the monument called The Lotus-Tower. This tower was the gift from Soviet to Egypt when dam was finished. I was more exited to see the temple of Isis. To rich to the island and visit the temple we had to use the small motor boat. Just before the harbor area where all tourists busies stop was located plenty of shops with attacking salesman’s. It was noting new or uprising and so far we get enough with practicing and learned how to avoid them. Our guide arranged the private boat for only our group. This short boat adventure lasted round the fifteen minutes and son after we saw the island and the temple. We get on the land, passed one more salesman invasion in order to start with our guided tour in the temple complex. The island temple was built during the Ptolemaic dynasty. The principal deity of the temple complex was Isis, but other temples and shrines were dedicated to other deities such as Hathor and Harendotes. 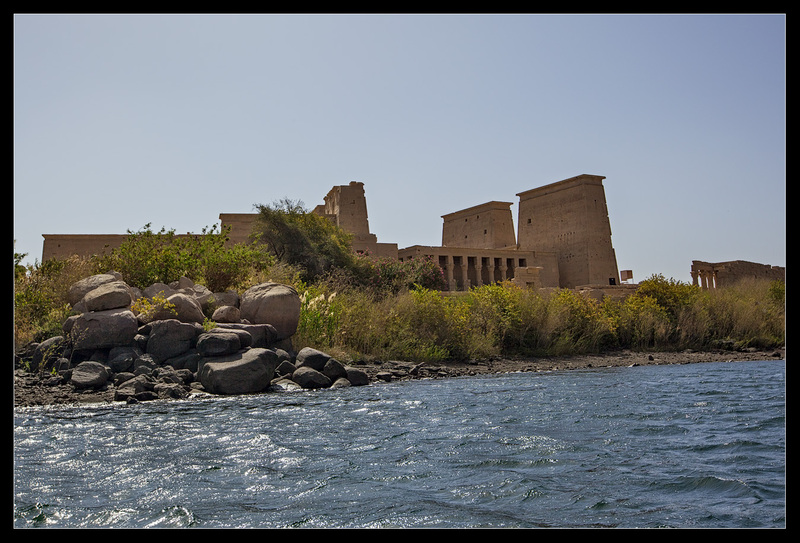 When Aswan Low Dam was completed it threatened many ancient landmarks, including the temple complex of Philae, with being submerged. In 1960 UNESCO started a project to try to save the buildings on the island from the destructive effect of the ever increasing waters of the Nile. The weather was really nice and with few tourists giving me opportunity to explore and photograph in piece. One of the small temple was still under the reconstruction and I saw few workers working on it. On previous visit on the dam and here in the temple complex I used only my Canon 5D Mark II with EF 16-35 F/2.8 Mark II and Sigma 70-200 OS for documentation. In the late afternoon we arranged two the cars to visit the special coffee shop located on the hill above the city. The place had the great view on the city and surrounding. We had a plan to spend an hour there and later take a walk on the bazaar located in the middle of the city. Only me and my two new friends went there by our self and was the only tourist walking around. It was many shops and salesman’s located on the each side of the walking street willing to sale and to get us inside their shops. We hadn’t plan to by anything it was just curiosity that was the main reason of visit. Later we saw huge shop with plenty of the exotic spices and decided to follow inside. Saffron is really exotic and expensive spice here in the Sweden and the guy from the shop said that he had some for sale. He promised the good price and that it was the real stuff and we bought 45 gram each. I don’t have any shots from this walk or any place. Day 4 started really early in the morning. We get wake up call 30min before our trip started or 03:30 AM. Breakfast box was prepared and waited in the reception. Somewhere in the Aswan city was the minting point for all cars and busies planed for desert drive. We left the city just few minutes after 04:00 AM and started the more than three hours drive south of the Aswan in the direction to the Sudan. We saw sunrise from the mini bus driving more than 100km/h and taking picture wasn’t good idea. I get 45 min sleep in the bus and was pleased with that. Usually I can’t sleep in the car or bus and this time I was really happy with that. 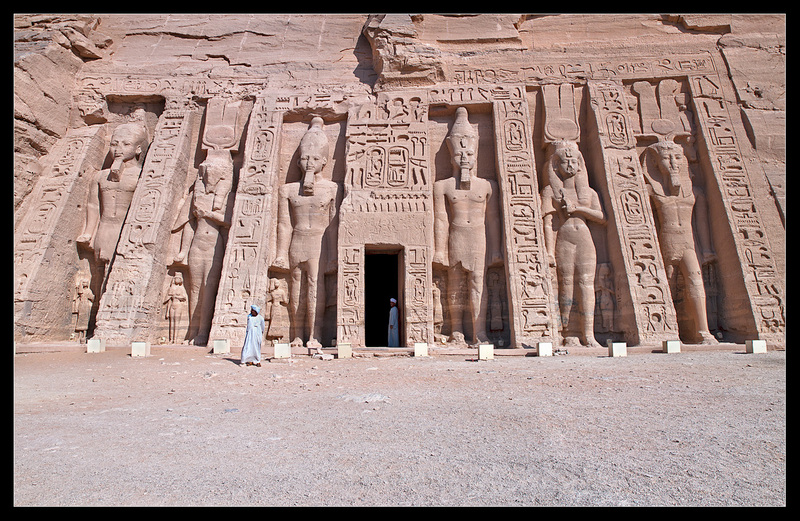 The Abu Simbel temples are two massive rock temples in Abu Simbel area. 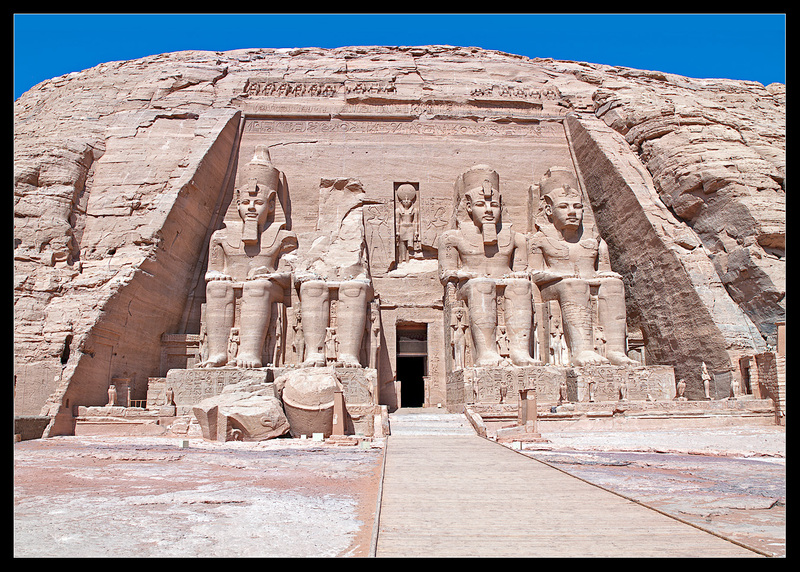 Both temples were originally carved out of the mountainside during the reign of Pharaoh Ramesses II in the 13th century BC. Ramses II built those temples to himself and his queen Nefertari, to commemorate his alleged victory at the Battle of Kadesh, and to intimidate his Nubian neighbors. The complex was relocated in its entirety in 1968, on an artificial hill made from a domed structure, high above the Aswan High Dam reservoir. We arrived at the 07:30 in the temple area and get guided tour as usually. After that we had almost two hours for our self to explore and photograph. It was plenty with tourists but if you have patience you can get picture without tourists on it. Me and my new friend from the group who was interested in photogr aphy worked really hard and succeeded to get plenty with good shots. We come back to the boat round the two o’clock and lunch was served. Afternoon was free from any kind activities and we spent some time on the upper deck lying on the comfortable sun beds with some Egyptians beer. Later after the dinner we had belly dancing show and some kind of the dervish dance but on the Egyptian way. After breakfast round the 8 o’clock was the time for the sailing with the traditional sailing boat called Feluccas. After 45 min sailing we changed to the motor boat and it was the time for some exploration of the flora and fauna. The guide was the expert on the birds and I was really happy to hear that. We saw plenty of the birds and I get some really cool shots. Our next stop was the Nubian village and if someone was interesting even camel riding. I was the only one who didn’t wanted to ride and arrived to the village by the boat. I get cool pictures from my group members riding on the camel backs and having the desert in the background. We visited one Nubian house and had really fun experience with house owner and their big family. Family women’s was playing and dancing for us and later even some of our group members joined as well. 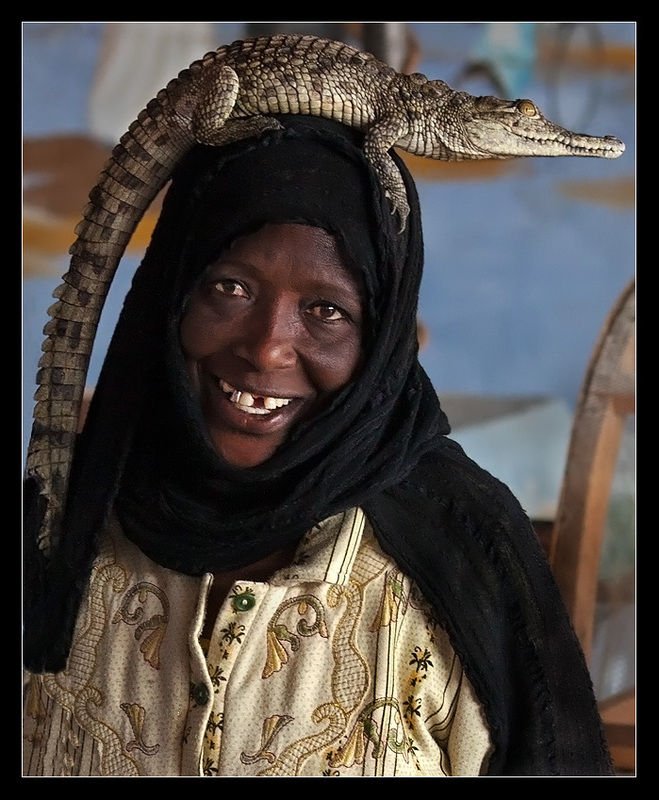 This family had baby crocodiles as the house pets captured from the river Nile. We had enough with time to visit the local school and learn how to count to 10 in the Arabic and Nubian language. After that it was the time to come back to the boat and had a lunch. This was the last day in the Aswan and we started to cruises back to Luxor. It was planed that it would take two days to reach to the Luxor with two stops during the nights. Same evening we had funny theme by using the same cloth from previous Egyptian night. Late at the evening we arrived in the Edfu and stayed for a night. Just before the sun set we went outside the boat to the local coffee shop and had some fun. We had late breakfast at the 8 o’clock and free time on the boat all the way back to the Luxor. it was planed to reach the Luxor in the late afternoon and later visit the local carpet shop and the temple of the Luxor. We had quick visit to the captain cabin during the time and get short information about our boats history. In the afternoon we reached to the Esna lock on the Nile River. Plenty of salesman was around the lock trying to sale their handcrafts and other products. Most of them was children and few was adults. We continued our trip and as the planed we arrived to the Luxor round the 3 o’clock. The first visit was to the one bazaar area with the carpet shop located close to the Luxor temple. The owner was really funny guy and had plenty with beautiful silk carpets, but no one bought any of them. I guess no one was prepared to spend bigger amount of money even if the price was extremely good. After this place we went to the Luxor temple. The sun was on the way down and I missed opportunity to document this monument during the daylight. 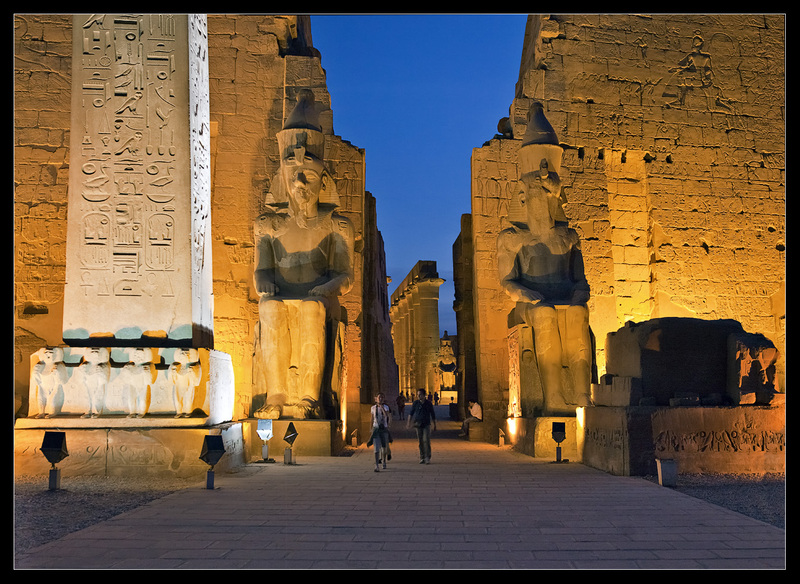 All ancient monument in the Egypt are illuminated which binged the opportunity to get nice night shots. I had with me my monopod which helped me a lot considering that my Hasselblad don’t have high ISO opportunities. I didn’t planed that we are going to spent so much time at the market place and didn’t binged with me my 5D Mark II. I succeeded to take few good shots with beautiful light of the parts of the complex before the night was over. With this temple my Nile adventure was over. We waked up really early in the morning and checked out from our boat. We still had round 400 km left to the Huragada city located on the Red Sea coust. At least five hours drive through the desert with one short stop before airport and five more hour flight to the Stockholm Sweden. The whole bus trip was nice and safe and we got some extra time to drive inside the Huragada and drop half of the group at their hotel for one more week and rest of the group including me strait way back to the airport to catch the plain to Sweden. 1. The weather is always good and it newer rain which mean that you don’t need to worry about damming your camera with water. On the other hand if you are vising the desert areas you should consider that it is windy sometimes and small dust and sand particle can end in your equipment. So have in mind that you need to protect your camera somehow and clean later back to your hotel or place of say. Sand can easily damage your lens or inside your camera house. If you are just visiting the historical sites than you don’t need to worry so much. Usually you have the bus transportation all the way to the site and most of the places are located in the urban areas. Giza plateau and Sakara desert are little bit more open areas and you should be careful. 2. Most of the sites don’t allow tripod to be used so check before you are visiting. Some places do but with paying some extra fee. I had monopod on the few places and i dint payed any extra for that. Only the one place is not allowing any kind of photography and this is the Valley of the Kings. We get recommendation from our guide to left the camera in safety on the bus. Flash was not allowed in the just few places. I newer use the flash and can’t remember in which areas was not allowed. 3. The light can be really different depending of which time you are visiting the site. Even in the morning the light can be really harsh creating the strong shadows. It is not easy for cameras if you are using camera on auto or any other program to meet the light properly and you can get sometimes some parts under or over exposed. I always photograph with manual preferences and like to have control over my camera. I don’t even use auto ISO as well. In some situation I choose to underexpose my shots and later fix it with the help of software than to overexpose and lost all details. Taking shots in desert when you have light colored sand reflecting the sunlight and blue sky with some clouds sometimes can be problematic and using the filters can help a lot. Even the best screen behind the camera can be difficult to see and use when the light is to strong and using the histogram is really important. If you don’t know how to use it than take some research on the internet and learn it. It is really easy to understand how it works and can save your day.